Review posted March 4, 2018. Kids Can Press, 2017. 48 pages. This fascinating true story is presented in picture book format, even though there’s a lot more text than what is usual in a picture book, so this is for upper elementary school children. 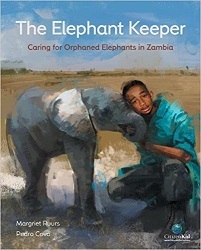 The author features an African boy named Aaron who found a baby elephant swimming in a hotel swimming pool. No other elephants were around, so his mother was probably a victim of poachers. The elephant needed to go to an elephant orphanage. Aaron was good with animals – and ended up working at the elephant orphanage himself and helping with the baby’s recovery. The way the story is presented isn’t strictly true, as we learn from the notes in the back – Aaron wasn’t actually the one who found the elephant (named Zambezi) in the pool, but he was involved in Zambezi’s care and ended up working in an elephant orphanage. But the story does a lovely job highlighting the plight of elephants whose families are killed by poachers. Every several pages, there’s a spread apart from the story with photos of elephants and background facts. These are inserted at a point where the reader finds them very interesting. So this is a lovely book for teaching kids about elephants and how humans are trying to save them from extinction. As well as the story of how a life was changed and a boy’s love for animals turned into a career saving them. Notes at the back tell kids how they can adopt an elephant or help in other ways.